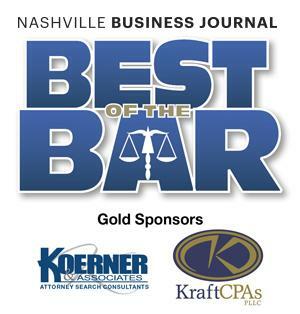 Congratulations to the following Sherrard Roe Voigt & Harbison attorneys who have been named the Nashville Business Journal’s Best of the Bar for 2015. The Nashville Business Journal took nominations from the public for two months. Eligible nominees then participated in two weeks of private voting, allowing the nominees to vote on one another. This process is designed to find out which nominees truly are the best of the bar, according to their peers.